Dubbed “Little Vienna” by the Croatians, Varaždin is unaffectedly quaint and hugely historical. You can easily spend a day or two browsing your way through the museums and medieval castle, stopping in between at the town’s many (very inexpensive) cafes. 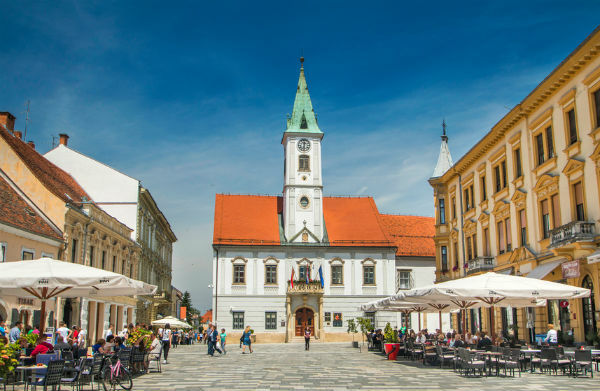 For lovers of Baroque architecture, Varaždin delights, thanks to careful restorations which have since made it home to one of Europe’s most prized collections of intact Baroque buildings. A meander through the turreted, gleaming-white Stari Grad (Old Town) is a treat, as is a visit to the city museum. And it’s impossible not to love the cobblestoned, pedestrianized town square, Trg Kralja, with its pastel-coloured facades lining Varaždin’s town centre and the ancient streets radiating from it. When wandering around Stari Grad, you’ll find Varaždin’s awesome whitewashed medieval fortress, surrounded by a beautifully manicured park. Dating back to the 14th century, it once protected the town from the Turks. Today it’s a museum showcasing paintings, furniture, ceramics, watches, decorative items and weapon, amassed over the centuries and displayed throughout the museum’s 30 exhibition rooms. Enter via a drawbridge and amble between the archways, chapels and courtyards of this sprawling castle/museum/fortress. Inside the classicist Hercer Palace, you will find things you may not expect: bugs! This fascinating collection of insects from the insect world covers around 1,000 different species and offers up tens of thousands of specimens. You will also find well-organised examples of insects’ nests, habitats and reproduction information, along with interactive displays and free audio-guides. Enter the rococo-style Sermage Palace and you will arrive at a pretty 17th century gallery displaying portraits and landscapes from Italian, Croatian, German, Dutch and Flemish schools. Don’t miss the carved medallions on the building’s façade. For a break from the town, take a 15-minute walk northeast from the centre and you’ll find yourself amid verdant, tranquil river banks, lined with footpaths and several terraced cafes – perfect for kicking back and relaxing. In keeping with its baroque beauty, Varaždin is famous for the fabulous baroque music festival, Varaždin Baroque Evenings. Visit in September when you can enjoy two weeks of sounds from local and international orchestras which fill the churches, cathedral and theatres around town. If you’re travelling in late August, you may catch the eclectic Špancirfest just before Baroque Evenings kick in. This festival brings life to the town’s parks, streets and squares with strains of world music, along with street performances, traditional crafts and contemporary arts. Over a period of two to four days in mid-September, the annual Trash Film Fest draws in film buffs who are bound to enjoy the extravaganza of low-budget action films screened at different locations throughout Varaždin. If you plan on finding yourself in this best kept Croatia secret, spend some time exploring your European Travel Insurance options.